In Canada and the rest of the northern hemisphere, the first day of the winter season is the day of the year when the Sun is farthest south (on December 21st or 22nd). This day is known as the Winter Solstice. The declination of the Sun on the winter solstice is known as the tropic of capricorn (-23° 27'). In the Southern hemisphere, winter and summer solstices are exchanged so that the winter solstice is the day on which the Sun is farthest north. A common misconception is that the earth is further from the sun in winter than in summer. Actually, the Earth is closest to the sun in December which is winter in the Northern hemisphere. As the Earth travels around the Sun in its orbit, the north-south position of the Sun changes over the course of the year because of the changing orientation of the Earth's tilted rotation axes. 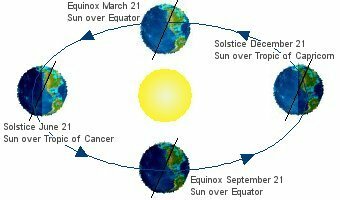 The dates of maximum tilt of the Earth's equator correspond to the Summer Solstice and Winter Solstice, and the dates of zero tilt to the Vernal Equinox and Autumnal Equinox. The reason for these changes has to do with the Earth's yearly trip around the sun. For part of the year the Earth's North Pole points away from the sun and part of the time toward it. This is what causes our seasons. When the North Pole points toward the sun, the sun's rays hit the northern half of the world more directly. That means it is warmer and we have summer. The day of the winter solstice is the shortest day of the year. The length of time elapsed between sunrise and sunset on this day is a minimum for the year. The Seasons and the Earth's Orbit - Through the Naval Oceanography Portal, the United States Naval Observatory provides astronomical information on the Earth's orbit around the Sun and how it relates to the changing seasons.